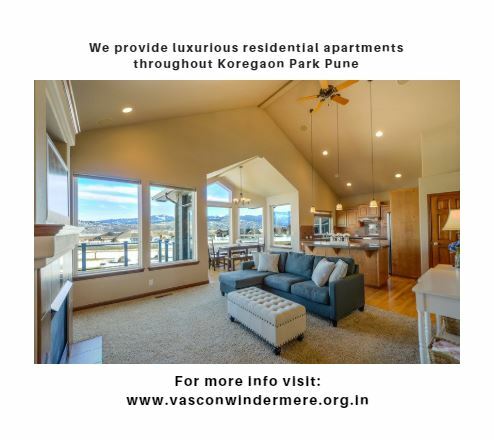 Vascon Windermere: Affordable homes in Pune! Vascon Engineers Ltd. has launched a new project called Vascon Windermere at Koregaon Park in Pune. The magnificent project has 3 BHK, 4 BHK and 5 BHK apartments of different configurations to meet the needs of different home buyers. The residential project offers several amenities of international standards which allows home buyers to enjoy an urban lifestyle. The project has a gymnasium, kids’ play area, swimming pool, sauna room, tennis court, Wi-Fi connectivity, and a landscaped garden.Vascon Windermere Pune offers all the amenities that you desire. Situated in a prime area of Pune, Koregaon Park is just 4.4 kilometres and 8.2 kilometres away from the Pune railway station and airport. It has a number of well-known schools, renowned hospitals, hotels, bank branches, shopping malls, and other lifestyle centres which provide endless facilities for residents. Koregaon Park is located south of the Mula- River in Pune. It is situated just 3 - 5 kilometres away from Pune railway station and just 6 kilometres away from International Airport. The complex is well-connected to surrounding areas including Kalyani Nagar, Yerwada, Magarpatta, Ghorpadi, and Sangamwadi. A number of famous tourist spots are also near the area including the Osho Ashram, German Bakery,Hotel Westin, and Chabad House. Koregaon Park is in close proximity to Kalyani Nagar and Pune's primary IT/ITES hub. The Boat Club Road is also situated 2 kilometres away from Koregaon Park. A number of leading schools are located in the area are Noah's Ark Preschool and Daycare School, Sant Gadhge Maharaj School, Poona International School, St. Joseph's School, Vidyalaya English School, and Vidyalaya. There are a number of renowned hospitals like Rajarshi Shahu Maharaj Hospital, Budhrani Hospital, Bhavani Hospital, Inlaks, and Budhrani Hospital. Popular hotels in the area are Oakwood Hotel, The Westin,Malaka Spice, and Park Central. 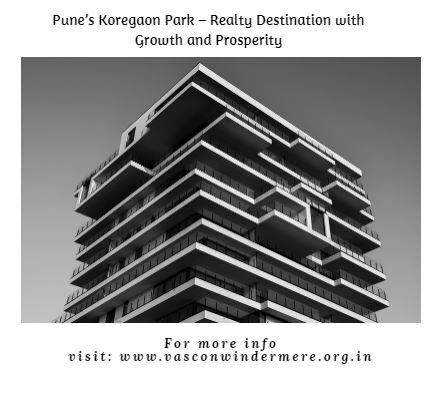 Koregaon Park is one of the most sought-after residential areas in Puneand has seen an immense demand for residential properties. Vascon Windermere price is affordable and the developer is offering a number of easy payment options. Making an investment inVascon Windermereis sure to good returns in the near future. Premium pet care solutions by The Peppy Paws. Garbage chute with treatment plant.